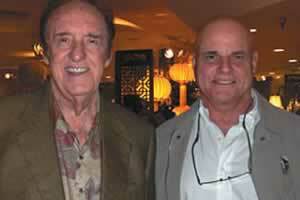 Actor-singer Jim Nabors has died. He was 87. Nabors was best known for playing Gomer Pyle on The Andy Griffith Show and on his own sitcom, Gomer Pyle, U.S.M.C. The combined shows ran for 13 seasons on CBS. According to the Hollywood Reporter, Nabors died early Thursday morning. Nabors also released 28 albums and numerous singles, including six albums that went gold or platinum. For more than 40 years, until 2014, Nabors sang the unofficial Indiana anthem, Back Home Again in Indiana, prior to the start of the Indianapolis 500. With few absences due to health, Nabors sang the song from 1972 to 2014. Nabors met his future husband, Stan Cadwallader, a former firefighter, in Honolulu in 1975. The couple exchanged vows before a judge in a Seattle hotel room in January, 2013, just a few weeks after Washington state legalized such unions. Up to the time of his marriage, Nabors had not spoken publicly about his sexuality. He told Hawaii News Now that he'd know all his life that he was gay.